The beach is a beautiful place and I happily admit that. The lulling crash of blue-green waves, the sun bursting through the clouds reflecting off the sand crystals, and the smell of the ocean on the breeze are all wonderful. With that said, I’m just one of those extremely rare people who doesn’t enjoy going to the beach for some of the other beach related reasons like, extreme relentless heat, sweat, sun burns, clamoring crowds, hours of boredom lying around like a lizard warming its cold-blooded circulatory system, and sand… sand everywhere… in every nook and cranny of any article of clothing or body part. That’s why I excel at finding things to do in or around the beach that can take my mind off the struggle between aesthetic beauty and physical discomfort. Clam shacks, bars, and fresh seafood are just some of the prime reasons to look forward to going to the beach whether you enjoy the beach or not. Iggy’s is one of those places offering the simultaneous benefit of delicious food, drink, and shelter from the beach. It is a landmark heralding the way to Oakland beach since 1989, which has since expanded from a simple doughboy business to include a famous clam shack, restaurant with bar, and even a creamery serving ice cream. I don’t always make it out to Iggy’s as much as I’d like to, so I was unaware how much the business grew over time. After luckily finding a parking spot on the street near Iggy’s (there is also a parking lot, which is often full), we walked up expecting to stand in the long line at the takeout window for the clam shack. We passed a big sign for Iggy’s Boardwalk and immediately had to know what it was. Peaking inside the door revealed a fully renovated indoor restaurant and bar with (my breath actually catches in my throat and a tear comes to my eye) air conditioning! At the back of the restaurant is a beautiful sun-drenched patio overlooking the ocean with an outdoor bar where patrons can also sit. I asked the host what the difference was between the clam shack takeout window I loved for years and this somewhat new restaurant addition. Her simple answer was, “Nothing really. It’s the same menu, but with some more additions and you can sit inside at a table.” With a nod, my wife and I requested a table for two. The service came with a smile and some helpful information about specials or how to order certain combinations of items to maximize our deal. Clam shacks are renowned for their fried seafood and great clam shacks know how to balance breaded fried food properly so that it isn’t a gut busting, heavy, mess of a meal. Iggy’s not only knows how to properly bread and fry their food for optimum balance, but they offer more than just the typical fried seafood. 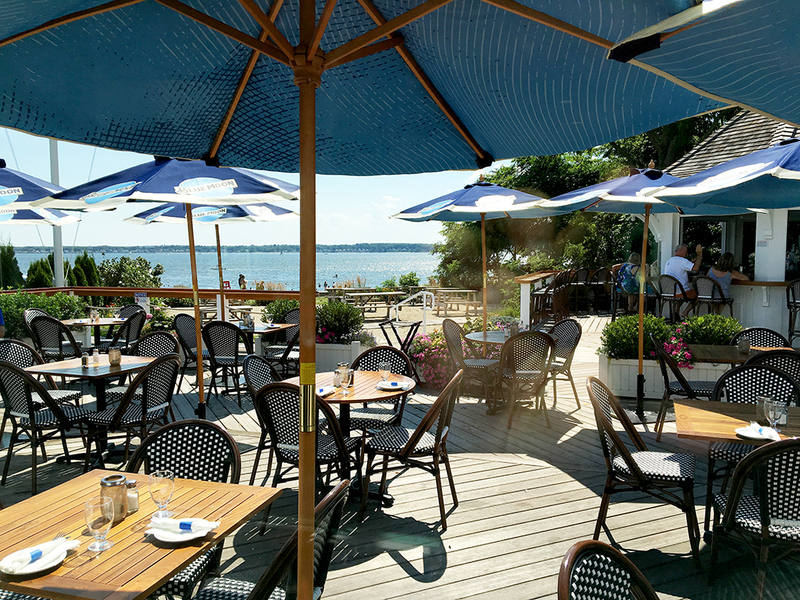 The menu is expansive to include items like chowder, pasta, sandwiches, lobster, and a raw bar. No matter what you order, I always recommend starting with the clam cakes and chowder combo before moving on to other items. 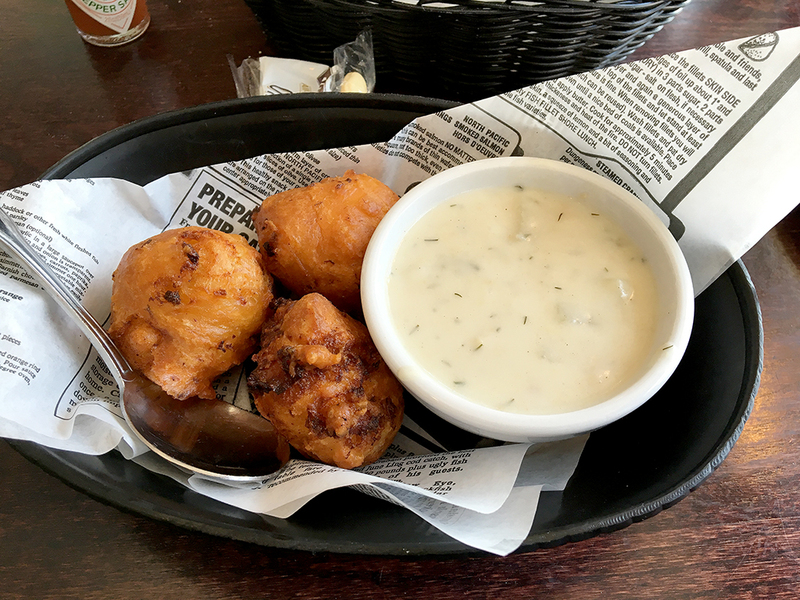 Clam Cakes and Chowder – This combination is a Rhode Island classic and Iggy’s makes them wonderfully. If a clam shack can’t make a decent clam cake or a good bowl of chowder, then just leave and never return. The clam cakes at Iggy’s seem standard at first, but it’s because they are so good that you don’t notice what makes them great right away. The cakes remain crispy and they aren’t too salty or under-seasoned. They do have chunky pieces of clam in them and while any clam cake could always use more clams, Iggy’s does a good job with the ratio. The white New England style clam chowder is also excellent. It is perfectly seasoned containing a lot of potatoes and clams. The broth isn’t too thick or too runny, but just right as a pairing with the heavier clam cakes. I highly recommend the clam cakes with chowder as not only a great representation of a New England staple, but as a fully satisfying meal. The white New England style clam chowder is also excellent. It is perfectly seasoned containing a lot of potatoes and clams. The broth isn’t too thick or too runny, but just right as a pairing with the heavier clam cakes. 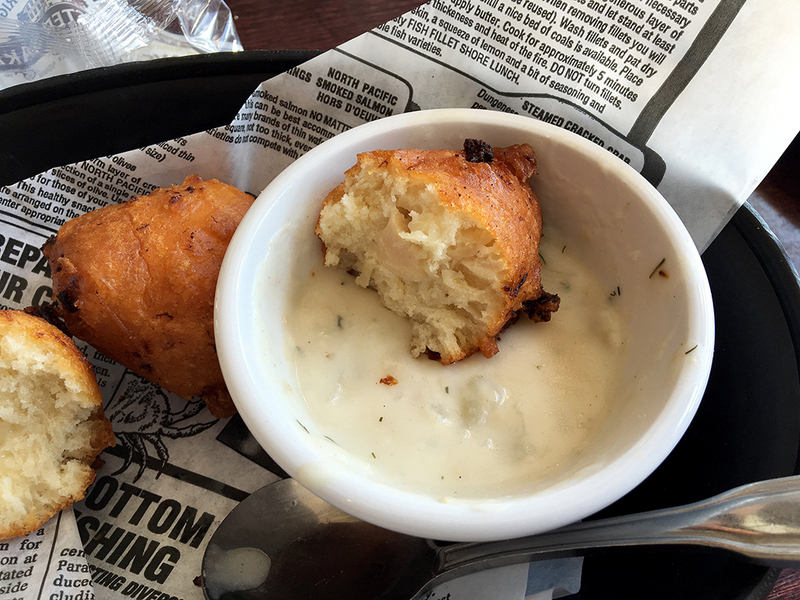 Dipping the clam cakes in the chowder is pure perfection and a few drops of hot sauce on the clam cake itself is just another way to change up the experience. I highly recommend the clam cakes with chowder as not only a great representation of a New England staple, but as a fully satisfying meal. Lobster Macaroni and Cheese – Offered as a special that day, my wife and I split an order of the lobster mac and cheese. We asked our server if he had tried it before and sadly, this young soul replied that he had only tried the regular version without lobster because he couldn’t afford the lobster. That broke my heart a little, but we appreciated the candor as well as the fact that he said the macaroni and cheese was some of the best he’d ever had. 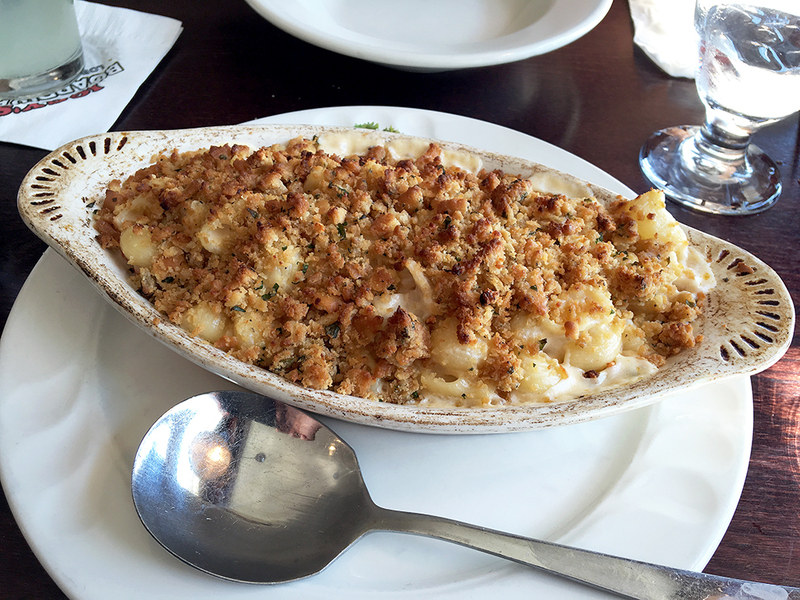 The macaroni came out as a baked dish with a beautifully browned breadcrumb topping. The pasta consisted of shells smothered in a molten garlicky cheese sauce that thickened as it cooled. While we enjoyed the familiar yet different macaroni thoroughly, we did notice that the advertised lobster was almost non-existent. There were some very tiny, shredded pieces of lobster, but they were lost in the ocean of mac and cheese. The upside is that the mac and cheese tasted good and I felt better knowing that the server wasn’t really missing out all that much by having the non-lobster mac and cheese. 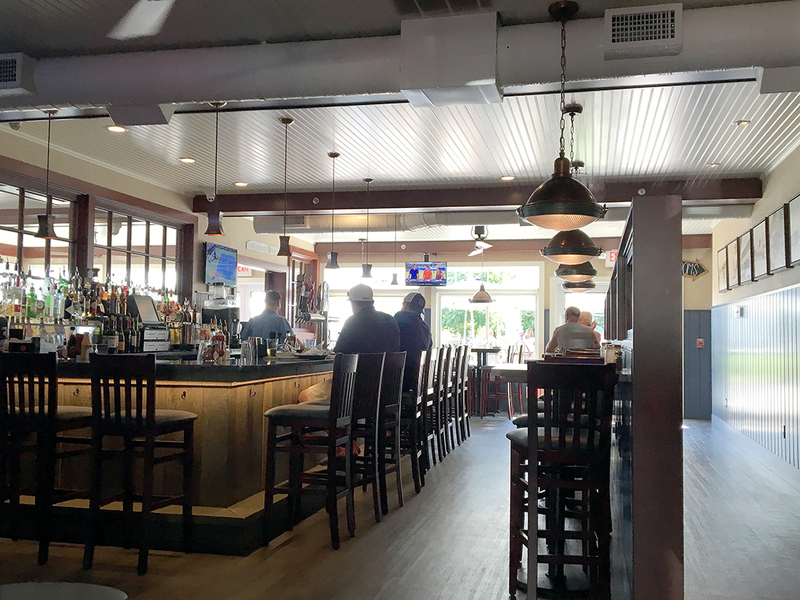 Iggy’s is a wonderful place to satisfy a craving for clam cakes and chowder, but it also offers many other dishes. Their doughboys made them famous and their clam shack sealed their presence in the hearts of Rhode Islanders. Nonetheless, they continue to expand with a full restaurant, bar, and creamery. 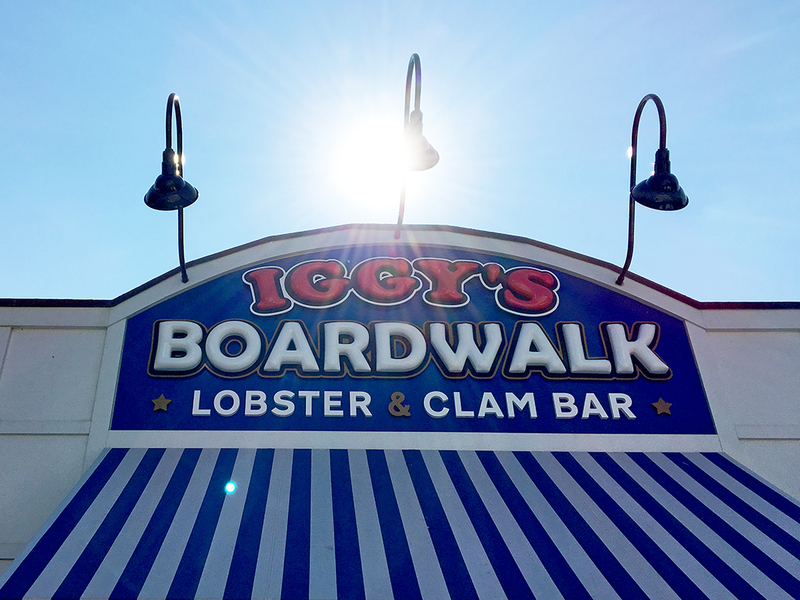 I highly recommend Iggy’s Boardwalk as a more relaxed dine-in alternative to the bustle of the clam shack that both serve the same fantastic seafood. Your description about the place and the food are inviting as usual. However, I particularly like your funny side remarks. Keep going manfuel.